Songs about loss are rarely upbeat enough to get you moving in your car, but for me "Starlight" by the English alternative/progressive rock band Muse manages to combine sorrow and loss with rock and roll supported by a driving bass line to make a catchy song with some deeper meaning. Muse is a band whose music leans towards more sullen material, and some critics of the band chastised this song for being too pop-oriented. Overall their music style is defined by the music genome project as frequent use of minor key tonality, subtle use of piano and some electronica influence. This song exemplifies these traits well with simple piano and guitar melodies, with more space-rock bridges breaking the song into two very different feels. Here is the video from YouTube. The visuals of the video below are not highlighted in this post. Pay more attention to the audio and lyrics. In "Starlight" the band makes use of outer space, a common theme on this album, as a metaphor for loss and distance. The ship taking the singer 'far away' could be an allusion to disease, especially one like Alzheimer's which erases the memories of the important people in your life. Or more generally, the decreased level of consciousness as someone gets closer to death. "Chasing a starlight" can have multiple meanings in reference to end of life. On a very obvious level 'seeing the light' is commonly perceived as an experience of someone near death. And then when combined with star, the light could be a thinly veiled reference to the 'stars in heaven.' But why would the protagonist of the song be 'chasing the starlight?' Here you can start to explore many different questions. Could the 'starlight' be thought of an ideal, perfection, purity or some unobtainable goal? This impression makes more sense when he wonders if the effort "is worth it anymore." Is trying to be good and perfect the reason to get to a wonderful afterlife? Or is the person reflecting on the good (starlight) he has striven for which now appears to 'mean nothing' since he is dying? I will note the band stated this is a "a love song about missing someone, friends, family, someone you love" and therefore not explicitly about dying. The bridge/chorus gets more aggressive with crunchy guitar chords, as if he is fighting the loss, with the lines, "I'll never let you go, if you promise not to fade away." This line switches the perspective as most people working with Alzheimer's see the patient as the one slipping away, but if you (as the patient) are slowly losing your memory and ability to communicate, it can also seem like everyone else is fading away from you. Much like some weird palliative care Doppler effect; who is fading from whom? "Black holes and revelations" is the name of the album and also a key lyric in "Starlight." This is made even more important when paired with the line of "our hopes and expectations." Palliative care is about finding 'hope' and managing 'expectations' when discussing the uncertainty of the future of a medical illness. But when patients and families 'hopes and expectations' are not managed well it may seem like 'hope' get dashed into a 'black hole' never to escape. Any information contrary to current 'expectations' then becomes a dramatic 'revelation.' Other influences regarding spirituality and end of life issues could be made with the Biblical Book of Revelations, or the unknowable of what exists in a black hole, echoing the uncertainty about what happens after death. 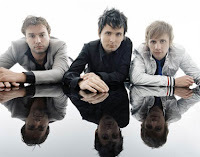 For those who liked this song, some of Muse's other songs highlight issues relevant to palliative care and spirituality including "Thoughts of a Dying Atheist," "Sing for Absolution," "Time is Running Out" and others. "Starlight" by Muse (Bellamy) from the album "Black Holes and Revelations" (2006) from Warner Bros. Records. I, too, first heard Muse (and this song) on the Music Genome Project (www.pandora.com) and I too was taken with the song. Unlike you, I hadn't paid much attention to the lyrics. I'm glad you did. You've a keen sense for the humanity in the arts. It has a good beat and piano. Without that it doesn't matter what the message. You have to really enjoy the song to care about the message.